Adventure Education was founded on our Principal Educator’s belief that a bonded team is an attractive team. Armed with this belief, Rodrick left a promising career as a sales and marketing director to establish ae, with the goal of making ae the premier choice for organisations’ team-building needs. Since founding ae in mid-2010, Rodrick and the team have run more than 350 programmes for clientale from private and public entities, utilising innovative methods and tools to meet clients’ expectations and objectives. As such, we enjoy a healthy reputation as an effective and competent training company. Find out more about our past clientale here. ae training focuses on facilitating clients’ learning needs through experiential learning and reinforcement – over typical lessons and classroom-style instruction. 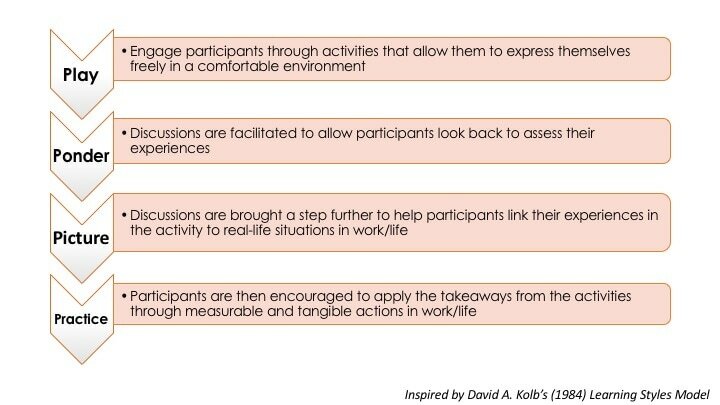 We employ the following 4P Model, based on Kolb's (1984) learning styles ideals, to design our team building activities. Experiential learning seeks to engage individuals and teams through challenges of different levels throughout any course facilitated by ae. These activities are meant to be thought-provoking, opening up channels for participants to reflect on their experiences, derive useful insights and empowering them to make a positive impact in their environment or workplace. In our activities, we encourage participants to isomorphically-link their experiences with that of real-life situations – be it in conflict management, team development, leadership training et cetera. At the end of every session, ae aims to arm every participant with better knowledge and skills that would be effective for accomplishing goals in their teams or professional environment. This is the difference between experiential learning and classroom instruction. ​In ae, we believe that experiential learning is a powerful tool and sharing newfound knowledge is beneficial for a team. However, more often than not, we hear perfectly scripted, politically correct model sharing instead of a personal learning reflection. This will certainly dull the learning experience. To elicit genuine response, ae uses games and tools like cards, ropes and drawings, to have creative and differentiated sharing experiences. Together with a fun atmosphere and safe environment, participants tend to feel more comfortable and adopt an open minded to share. When personal learning experiences are shared, the team’s learning is enriched.